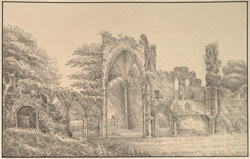 View of Calder Abbey in Cumbria. The Abbey was founded in the 12th century by Ranulph de Meschines, Lord of Copeland for an order of Cistercian monks. The Abbey, situated on the northern banks of the Calder River, was dedicated to St Mary and was a daughter house of the Abbey of Furness. The Abbey church was built in the conventional shape of a cross with north and south transepts and a tower at the point where they intersect. There was a small choir and cloister, a library and there would have been domestic buildings such as a kitchen and dormitories for the monks.